Cleanser is specially formulated for stainless steel surfaces. It is excellent for removing dirt, residue, fingerprints, water spots, and more. It provides a brilliant, streak-free shine without any hard rubbing. In addition to cleaning and polishing, it protects your stainless steel by leaving a shiny, protective barrier that resists fingerprints and repels dust and dirt. Recommended for all stainless steel, including large appliances like refrigerators, dishwashers, ovens, and stoves as well as the exteriors of smaller appliances such as microwaves, toasters and coffeemakers. Also excellent for stainless steel countertops, outdoor stainless steel kitchen elements and BBQ grills. 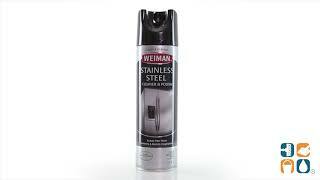 Order Weiman Stainless Steel Cleaner today and save!